It's that time of year when next years calendars are being released. I've started seeing 2010 calendars and there are some lovely ones! 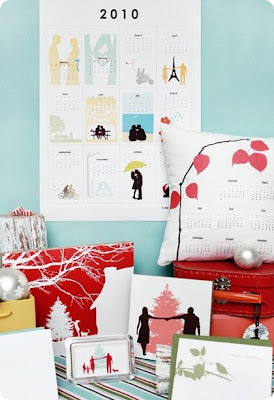 Loving all of the insanely creative paper goods sites and blogs. (see my blogroll for some great links!) I just discovered Le Papier Studio's etsy shop through fave blog, Orange Beautiful. 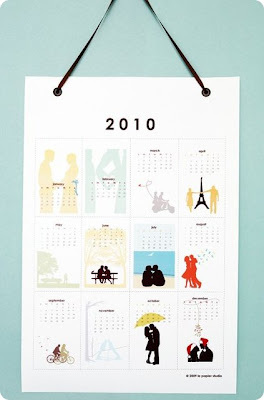 Le Papier's custom silhouettes are fantastic and I am loving her calendar. Far from the boring flip calendars, this one can be framed and added to your art gallery. Pretty colors and contrasting shapes, this is a great idea for function + form. And I love owner Vana's story. Read it on her blog right here.